It sounded like a good idea at the time: journey to a distant destination -- the island of Kosrae (part of the Federated States of Micronesia). A rocky, volcanic nation surrounded by pristine turquoise water, it's about half-way between Hawaii and Guam in the remote reaches of the Pacific Ocean. After four flights and almost 40 hours of travel, I landed at the tiny airport on this speck of land just a few hundred miles north of the equator. 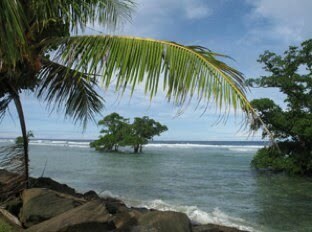 There aren't more than 8,000 people on Kosrae, which is only 42 square miles. During my visit, I traveled every inch of paved road on the island: about 14 miles all told. While the island is lush, overgrown and green with steep, forest-covered mountains, the main draw is offshore. Three sets of expatriate entrepreneurs have been working on developing three resorts to position Kosrae as a scuba nirvana, the ineffably ultimate destination for divers. The island is surrounded by unspoiled coral reefs, said to be thousands of years old. They're home to exceedingly colorful fish and other tropical wildlife. Not that I would know, as I'm not a diver. I was drawn by the prospect of snorkeling, but that proved to be a snare and delusion -- more on that later. The Kosraean resorts aren't elegant in the usual sense. Two -- Kosrae Nautilus Resort and Pacific Treelodge Resort -- resemble nothing more than 1960s roadside motels (plain concrete-box rooms with window air conditioners). The third -- where I stayed -- attempts a bit more native atmosphere. 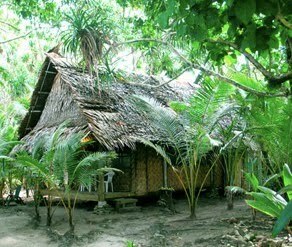 Kosrae Village Ecolodge & Dive Resort has 10 Pacific island-style thatched-roof cottages set in the jungle, just steps from the beach. Mine had a front porch leading into a large room with a table, chairs, small refrigerator (stocked with cold bottled water and fresh fruit) and a comfy bed. The bathroom included an open shower-- no need to worry about cold weather on Kosrae; it's hot and tropical year 'round. Netting and mosquito coils kept the critters at bay. At night, all I could hear was the gentle lapping of the waves on the sandy shore. There was a hermit crab living in a discarded shell just off my porch: we'd greet each other warily each time I passed. Meals in the resort restaurant highlight local cuisine, and there was always an absolutely silent cat or two at my feet begging quite politely for a lagniappe. The achingly slow Wi-Fi worked best in the restaurant, so I spent a lot of time there. Although Bruce was off island when I was there, Katrina couldn't have been more accommodating (the pair-with-no-last-names came from California in the mid-1990s to set up the resort). Katrina even drove me to the airport when my scheduled transportation was a no-show. Kosrae seems hobbled by its size, isolation and climate. Did I mention it was hot? It also rains. A lot. Like Several times a day Every day. Except for the trio of dive resorts, there's very little commerce. Gasoline is poured into cars with right-hand drive (from Japan) and pickup trucks with left-hand drive (from Guam), dispensed by vendors using gallon jugs and funnels. The only factory on the island mills flour from the taro root, a local staple. There are no restaurants outside the resorts and just a handful of what could charitably be called tourist attractions. When I was on Kosrae about a year ago, there was not one ATM on the island. Oh -- and nobody took credit cards. If I hadn't been the guest of the tourist office, I'm not sure how I would have survived with less than $50 cash in my pocket. Nobody'd mentioned the absence of what has become tourist staple worldwide. I've traveled six continents, and I've never ever been anywhere else where there were no ATMs -- and it was all the more frustrating because the official currency is the American dollar. All activity comes to a screeching halt on Sundays, because almost every activity except going to church is forbidden on the Sabbath. Those early missionaries, dour Congregationalists, had a profound and lasting effect on the island. Although the resorts and their restaurants remain open, nothing else does. No swimming in the Pacific. No diving. No boating. Even paddling about on inland waterways is frowned upon by the locals, who spend much of the day in church. Dress is modest and somewhat old fashioned (women never wear pants on Kosrae, and I never saw a local in a bathing suit). On my second afternoon on the island, looking forward to unique tropical underwater vistas, I grabbed my snorkeling gear and set out on a charter boat, headed for a secluded cove. The water was bathtub warm and the sun sparkling. But beneath the surface, all I saw was sand. Not one fish. Not one plant. Not one piece of coral. I had a crystal clear view of absolutely nothing but the smooth white sand bottom of a lagoon.